Musician Josie Quick is a woman of passion, earnestness and hope. It comes through in a casual chat over coffee, but you can really hear it in her music. As a professional jazz violin player, Josie’s livelihood is literally dependent on her fingers. Although the symptoms of lupus put her on the sidelines for a while, she was determined not to stay there. Josie, 46, designed her life so that she’s doing something she loves every day. She is the front woman for the Denver band Perpetual Motion. Perpetual Motion’s music ranges from rock, to swing, to bluegrass. The band has released five CD’s. They play at gigs throughout Denver and the region. In addition, other Colorado artists ask for Josie’s violin to accompany them on their own recording projects. 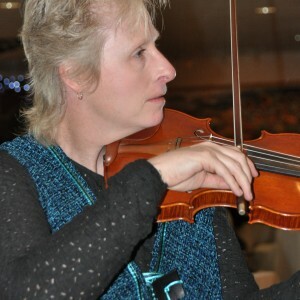 Josie is also a private instructor in traditional and Suzuki violin, has taught jazz and fiddle in addition to classical repertoire, and is the founder of the Frontera String Quartet. But her life change dramatically in the fall of 2008. She knows now that it was Lupus plaguing her, but at the time, she and her doctors thought it was psoriatic arthritis. “I was an active, healthy 43-year-old, in the prime of my life, right at that golden age where you’ve learned enough to take care of yourself, but you’re not too old to enjoy being young. Everything was going great, I felt like I was playing at my best, I’d just bought a new violin that I loved playing. I ate well, exercised regularly, meditated daily, was getting into yoga. I felt like I was doing all the right things to take care of myself,” she said. It began with her hands. Each knuckle was sore and stiff. She couldn’t make a fist, and couldn’t straighten her fingers all the way either. Josie figured it was tendonitis, which plagues many musicians. But when it jumped to other parts of her body, Josie feared it was psoriatic arthritis. And it just kept getting worse. “Then it all came crashing down. In a few short months I was reduced to shuffling around the house like an old woman. I needed help getting out of the bathtub. I couldn’t walk more than about a block. I couldn’t stand longer than about five minutes without pain. I needed two hands to lift a glass of water,” she said. For a year or so, she learned to accept that she had arthritis. Josie knew other musicians with the disease and she thought she would learn to manage just as they had. The one thing she was really thankful for was that she didn’t have lupus. But that didn’t last long. Her symptoms evolved with pneumonia and pleurisy and doctors determined it was lupus after all, not arthritis. “It was like the doctor hit me over the head with a brick and punched me in the stomach at the same time,” Josie said. Initially she was discouraged and thought she would die. But Josie remembered hearing that it’s possible for lupus to go into remission. She’s held onto that notion ever since. To the best of her abilities, she decided she will live her life as if she doesn’t have the disease. That doesn’t mean she didn’t suffer or could always ignore the pain. There were emergency room visits, medications trials, and more pluerisy and pneumonia. But there was also walking, sometimes a strenuous hike and sometimes just shuffling up the street and back; there was bike riding; there was getting out of bed; and there was always music. For a woman so accomplished in music, working hard at this simple exercise was highly frustrating, but playing music, at whatever level she was capable of, made Josie feel better – not just emotionally, but physically too. Meditation is another part of Josie’s daily routine that she turned to for solace, helping to improve her mind and body. It quieted her mind and helped her focus. A buddhist belief that Josie adheres to is the idea that nothing is permanent, life is in a constant state of change. She believed her pain wouldn’t last and that remission was possible. Despite the pain, frustration and fear, not all surrounding lupus has been negative. Many others who live with the disease have found a silver lining as well. “Before I ‘d worry about what others thought of my music. ‘Will they like it? Is it good? What do they think of me?’ Now I am so happy to be playing and I’m so happy to be standing – literally – that I just play for myself,”” she said. Learn more about Josie and her music on her website at www.perpetual-motion.net.